Back to school doesn't have to mean back to boring lunches - for you or for them. Keeping in mind research claims it takes 10-12 introductions to new food before a child is usually even willing to taste it, here are some ideas to keep the sandwich-making mill fresh and the lunch you make in your child's own tum. Think small. Small-sized foods are easier for children to handle and more fun to eat. 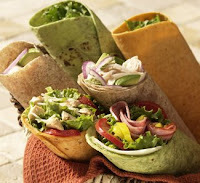 Cut sandwiches into smaller pieces, use tiny tortillas for wraps and small sandwich buns. Peel, cut and pack smaller pieces of different fruits to keep their interest. Try different types of bread for sandwiches and dippers - crackers, rice cakes, mini croissants, pita bread, mini muffins, little bagels, tortillas, focaccia, raisin or cheese bread. Take a look at those prepackaged lunches the kids always pester you for. They may not be overly nutritious, but you can pack the same types of snack foods, using healthier choices. Think about food safety. Freeze juice boxes or small gel packs to keep the rest of the lunch cool. Better yet, use an insulated lunch box. Lime Tip: Before filling a thermos with hot soup, rinse it with hot water (from the kettle), to heat it before adding the soup. Make your own snack mixes by combining dried fruits, unsalted nuts, pretzels, and baked crackers. Your kids will love munching on something crunchy and sweet or savoury. Lime Tip: To make the whole process easier, why not have your kids to plan their own lunch menu for the week? A good friend swears by this method. Simply ask them to write down or tell you while you write down their choices for each day of the week (perhaps with a little nutritional guidance from you), post them on the fridge or cupboard and that's it - no battles. Although we all know it's what's inside that counts, there is something to be said for the outside packaging to keep kids keen on lunch. Especially since the more disposable the bag, the more likely it is the whole lunch will end up in the garbage, as reported in the Seattle Times. 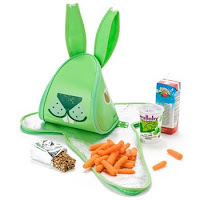 We say, bring on cute and funky reusable lunch carriers and keep our kids' lunches from getting traded or worse, turfed. Check out our NEW arrivals: tiger, panda and rabbit insulated lunch boxes that unzip to place mats, reusable sandwich wraps in funky fish and camo shark designs, and stretchy neoprene totes that insulate hot or cold for up to four hours. Visit Lavish & Lime for more fresh ideas for back to school must-haves.